Pacific Northworst 24 Hours of LeMons: The Winners! Rome, like the running-water bathroom that now exists at The Ridge Motorsports Park, was not built in a day. (And to LeMons racers, those two time frames seem roughly comparable.) But, like Rome, The Ridge is a pretty great place. Back in July of 2012, the 24 Hours of LeMons was one of the first sanctioning bodies to hold a wheel-to-wheel race at the Shelton WA road course. The potential was immediately apparent—the track, fittingly enough, was constructed atop a tree-lined ridge, with the main straight and paddock area at its base. The resulting transitions between the ground-level straight and the elevated portions of the track drew immediate comparisons to the elevation dramatics of a Laguna Seca or Sonoma Raceway. The supporting facilities, meanwhile, were a work in progress, and thanks to various financial, ownership, and management complications, they remained in that state for several years following that inaugural LeMons race. LeMons kept coming back, though, partly because of the challenging track layout, but mostly because of the unusually interesting participant fields that the event attracts. Now, the operational issues finally seem to be smoothing out, there are flush toilets (albeit with a bit of a short toilet paper supply—one thing at a time, people), and The Ridge may at last be on its way to realizing that early promise. LeMons staff isn’t sure why The Ridge attracts such a compelling group of entries. Whether it’s the coffee, the food trucks, hearing Sir Mix-A-Lot’s “My Hooptie” at an impressionable age—no one seems to know, but it’s one of the few places in LeMons where British Austins consistently outnumber BMWs and Miatas. Class A/Overall Winner: Turrible Ts and Pinto Bean Bandits, Model T GT. The Model T GT is a veteran, occasionally controversial, and undeniably successful LeMons machine. Built by Californians Dave Schaible and Dennis “Fish” Newman, the “T” is sometimes branded by critics as a “tube frame race car,” but is really a mish-mash of Model A frame rails, ’80s Mustang drivetrain, Pinto suspension, and ’27 Ford Roadster body panels. It’s different and it occasionally wins, which is probably the main source of the angst. But in reality the Model T GT hasn’t visited victory lane nearly as often as its West-Coast rival Cerveza Racing and their much more under-the-radar BMW E28 (which finished third at this race). The Ridge’s long front straight, which allows all but the slowest machines to surpass triple digit speeds, is especially well suited to the T’s highway-oriented gearing (it’s street registered), and the team cruised to a six-lap win. Class B Winner, Sumbitch Racing, Volkswagen Golf. LeMons’ middle class, designed for cars that aren’t terrible and yet definitely aren’t good, is especially well suited to middle-aged watercooled VWs. The relative chassis competence of the MK2 platform is probably good enough to warrant Class A consideration, but the often-dodgy axles, electricals, and other supporting cast members are cut from a solidly Class C cloth. Golf or GTI, eight-valve or sixteen, Neuspeed or No Speed—none of it seems to matter in the end. You’ll have ups and downs in your VW, and if you can tip the balance to 51/49 in favor of “ups,” you may wind up winning your class like these guys did. Still, it’s not a particularly common occurrence to get that favorable split. “C’mon, man, it’s our car, we can take a picture of it anytime,” chided one Sumbitch member to a teammate snapping post-race photos. “Not in this area we can’t,” the teammate replied, motioning toward victory circle. Class C Winner, Silversleeves Racing, Wolseley Hornet. The Canucks from Silversleeves Racing have a long LeMons history of bringing weird Austin products, from Minis to Ford Probe-powered Landcrabs, to the MG 1100 and Wolseley Hornet featured at this race. The MG turned in a not-bad-for-an-MG, sorta-intermittently-running, performance, while the Wolseley powered to a crushing, near 30-lap Class C victory. The secret? BMW parts: The Hornet features a completely mental setup of a standard Austin A-series 1275 block fitted with a twincam 16-valve cylinder head from a BMW K1200 motorcycle. Before you cry foul, consider this: The BMW head is hardly a bolt-on—team captain Sean Windrum describes the installation as “pretty straightforward, provided you are a mad genius and have assembled a machine shop in your basement.” Which is exactly what Silversleeves team members Aaron Anderson and Gregg Temkin did. While the bore spacing is pretty much spot-on—this is likely what inspired the idea in the first place—other important stuff, like water and oil passages, timing gear, and hardware must be variously rerouted, blocked off, or otherwise re-engineered. Then there’s the issue of fuel delivery. This is the third time Silversleeves has run this setup in a LeMons race. The first, they used an SU carburetor (like the car!) on a custom plenum to the BMW head. They quickly realized that the plenum acted like a giant collector, pooling up to a half a gallon of gas that was then randomly dumped raw into the cylinders. On the second try, they used individual throttle bodies (like the motorcycle!) which worked marginally better until they suffered a light head-on impact on track, at which point they discovered the throttle bodies themselves comprised most of the car’s crumple zone. Finally, this time around, they devised an all-new setup using a single throttle body (positioned further away from the impact zone than the ITBs) controlled by MicroSquirt engine management. * Apparently, this was the hot ticket—in addition to besting the next closest Class C competition by the equivalent of 70 miles, the Hornet finished 18th overall out of 69 entries. *If all of that sounds kinda fancy, considering LeMons’ $500 cap, let’s just say there may be a spending loophole for Wolseley Hornets running A-series motors with BMW motorcycle cylinder heads. Heroic Fix, Low Road Racing, Mustang II. There are more Heroic Fix opportunities for a Mustang II team than, say, a Corolla team. Nonetheless, Low Road’s cannibalization of their street cars to fix a busted fuel-filler neck plus the hours of wrenching assistance provided to the eventual I Got Screwed award winners took full advantage of their chances to impress. Plus, in the early moments of the Sunday session, the Mustang was part of the best racing of the entire weekend, a mano-a-mano, 10/10ths battle to the death with its teammate, a Pontiac Sunbird. I Got Screwed, Maple Bacon, Chevrolet Caprice. This Canadian group of LeMons first-timers figured they’d take a simple approach: Buy a common, cheap-to-repair car (Chevy Caprice), devise a no-trailer-required transportation system (GMC ramp truck), come to LeMons, dominate. Then, they had some last minute tech details to work out, which turned into a painfully lengthy process with their diminished crew. When they were finally ready to report to tech—way after the race had already started—the Caprice initially fired up and then immediately conked out. Signs pointed to some kind of electrical problem, so the team responded in the standard fashion for people who have no clue what they’re doing: by replacing the coil. That didn’t fix it, naturally, and that sent them down a long road of trial and error that lasted well into the final race day. At last, thanks to their own tireless efforts and considerable help from the Mustang II guys, the Caprice finally reported to tech with about three hours to go in the entire event. Replacing the new distributor with a different one at least partially cured (one of) the problem(s), and finally hit the track for the waning moments. Then, they had to find a place to fill up their ramp truck on a Sunday night so they could head back to Canada. They’d inexplicably bought a propane-fueled version, in case we forgot to mention that. Just Wandered Onto the Track After Dropping My Kid Off at Montessori While Listening to NPR Award, Galactic Snog Machine, Subaru Legacy. Well, this is the Pacific Northworst, and when an utterly stone-stock forest-green Subaru wagon shows up, the hypothetical back story wasn’t hard to imagine. Performance was stately, but the results speak for themselves: 40th overall, ahead of a Camaro, two Firebirds, a Corvette, and a Porsche 928. Judges’ Choice, Bne3GT Racing, Pontiac Firebird. Another group of LeMons first timers, this Brier WA-based gang arrived with—let’s face it—one of the most half-assed Plymouth Superbird themes we’ve ever seen. It was so thin, in fact, that it crossed over into maybe-they-did-that-on-purpose territory, like South Park animation. But, while such meager decoration would annoy us on, say, a track-prepped BMW, it was strangely endearing on a plain-jane blue F-body with an untouched 2.8 V6 and automatic transmission. The team also had an exemplary attitude. When the V6 predictably started showing some signs of devastating bottom-end failure, the team cheerfully proclaimed they’d probably solved it by switching to a heavier oil. When that predictably didn’t work, the team cheerfully proclaimed that they’d be back next time with a new engine. A V8, perhaps, since they’re replacing it anyway? “No, I don’t think so,” one team member cheerfully proclaimed. “I like the balance of the V6.” Our kinda people. When the team needed to be towed off the track after the engine expired for the final time, they conveniently limped the dead ‘Bird into the hot pits for easier tow-truck access. Then they somehow lost the keys to the car, which locked the steering and stuck the shifter in park. Once that was resolved, the tow-truck driver elected to tow them backwards into the paddock because it was a shorter route—not a bad idea, until the blindly-steered Pontiac wandered aimlessly sideways until it crashed clumsily into the truck’s front bumper. Organizers’ Choice, Low Road Racing, Pontiac Sunbird. 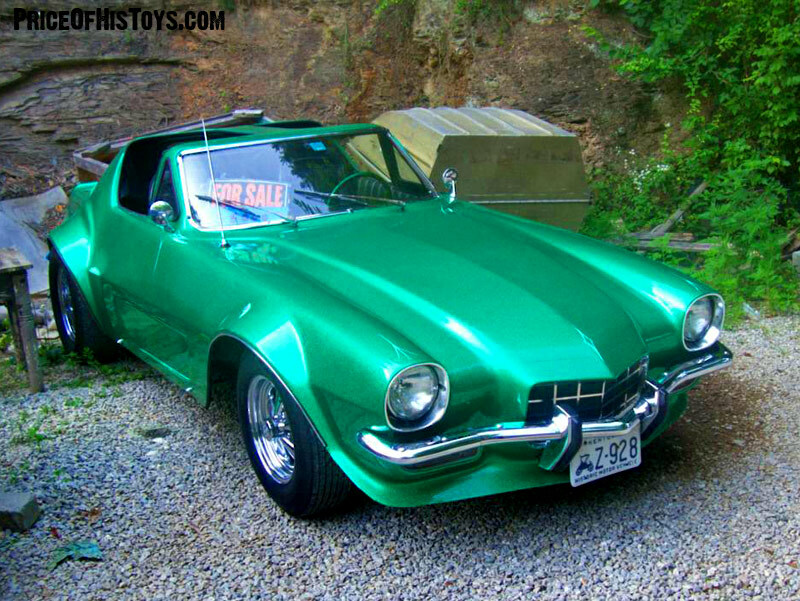 This author has an affinity for wrong-sized vehicles, such as the Mini Camaro, the Mini Nova, and the Big Bug. So you can imagine the excitement when an gosh-darn, rootin’-tootin’, put-me-in-a-feathered-cowboy-hat-and-call-me-The-King 1976 Pontiac Mini NASCAR rolled into tech. Campaigned by an offshoot of the Mustang II-driving Low Road Racing, the mini-NASCAR was based on a humble compact Sunbird, instead of the larger Le Mans that was the basis for the real NASCAR racer during that era. But the family resemblance is clear, and with downsized black steel wheels (made for a Honda) wrapped in suitably fat tires (LeMons-legal 200-treadwear street tires spray-painted with Goodyear Eagle branding), it was difficult to tell the difference until you stood up close. The team also opted for a lesser-known livery, going with Old Milwaukee graphics used by the late Tim Richmond (Richmond, a driver known for his hard partying lifestyle, died from complications due to AIDS in 1989, at the age of 34). Part of the plan was to provide the traditional bribes for the LeMons judges in the form of cases of Old Milwaukee, but it wasn’t until the car was painted and just about ready to leave for the track that a team member discovered Old Milwaukee wasn’t sold in Washington state. So, the team embarked on an eight-hour bizarro-world Smokey and the Bandit run to the Oregon border, where all they could find was non-alcoholic Old Milwaukee. They bought it anyway. Winner on Index of Effluency, R. Loewy Racing, Studebaker Avanti. Team Thunderchicken is a highly seasoned LeMons team that operated mostly under the radar for years. Despite being really nice guys in a terrible car, the team’s quiet demeanor and Kentucky Fried Chicken-themed Ford Thunderbird wasn’t quite enough to attract the attention of the awards panel. Slowly, though, LeMons staff realized A. The ridiculousness of a Thunderbird with a fake bucket of chicken on the roof, and B. The fact that the team showed up at essentially every single LeMons event west of the Rockies without ever complaining or causing trouble. All of that led to an Organizers’ Choice award at Sonoma Raceway in December of 2015, and now they’ve added LeMons’ highest award to their mantel. Elevating to the next level had much—well, really, all—to do with the addition of a new machine to their stable, a 1963 Studebaker Avanti. It is a car that completes the LeMons internet-commenter trifecta of 1. Complaining that the car must be worth more than $500, 2. Expressing dismay that such a rare and desirable classic would be raced instead of restored, and 3. Being unable to admit that the car is utterly terrible. Although items #1 and #2 are mostly a kneejerk reaction for keyboard warriors (once, a Facebook critic checked both of those boxes when writing about a 2001 Mercury Cougar), we’ll pay it a little lip service: Yeah, maybe even the worst Avanti in the world would maybe be purchased by some hypothetical buyer for a hypothetical sum of more than $500. Maybe. And, despite the fact that one LeMons staffer lives up the street from a guy who has literally five Avantis in his garage and driveway that rarely move, maybe it is some kind of precious classic that shouldn’t be used for something so frivolous as racing against two Austins and a Vanagon. Maybe. With that out of the way, C’MON PEOPLE, RACING AVANTI! The team, wisely figuring that modifying a Studebaker 289 for more track performance was a fool’s errand, focused on more potentially impactful prep. Like installing moon-disc wheel covers. That was about the extent of the mods, and aside from an between-race-session replacement of a leaky water pump, the old Stude ran like a (low-speed) train, racking up 253 laps, a 42nd-place finish, and well-deserved top honors in the sport. Next up in the LeMons circus is the LeMons South Fall event in South Carolina, which may not feature an Avanti, but will include a parade of LeMons cars and block party the night before the race on the streets of Camden. A BWM motorbike head on an Austin/Rover A series?! *checks internet*, blimey, you can actually buy kits to do that!